The Big Mac index is a guide to alignment of world currencies in regard to the US dollar and is based on comparing price for a McDonald’s Big Mac in various countries. 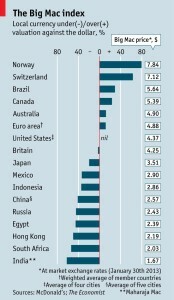 In January 2013 a burger in Russia cost $2.43 at market exchange rates, while in the United States the price was $4.37. So the “raw” Big Mac index shows that the ruble was undervalued by 44.5%. This means, the US dollar exchanges to the Russian ruble at 1/30.5 rate, while its actual rate should be 1/16.69, according to the index. That is some serious inflation in America, because when I left America years ago. A big Mac was under $3 (My last Big Mac – American made was $2.58 in Covington, Kentucky – seven years ago…) and my first one in Russia was over $2 even then. Basically the price in Russia has stayed dormant and in America it has rocketed..